Philippine Business Bank – the financial arm of the Yao Group of Companies, was recently granted licenses by the BSP to open 21 new branches. Philippine Business Bank (PBB) - the banking arm of the Yao Group of Companies, opened 2 branches lst May 16, 2013, bringing the bank's network to 81 branches. At the end of 2012, Philippine Business Bank opened 19 branches in Metro Manila and in key cities of the different provincial areas having a total of 78 branch network. this year, PBB has opened its newest branch in Roosevelt located at G/F Sunsquare Building, 323 Roosevelt avenue , Barangay San Antonio, San Francisco Del Monte, Quezon City. Since 2005 BusinessWorld Publishing Corporation has been aiming to nurture SME development in the Philippines. Last April 19, they staged the first leg of their 7th Year Run of the Entrepreneurs Forum Series, held at the Centennial A of Manila Hotel. 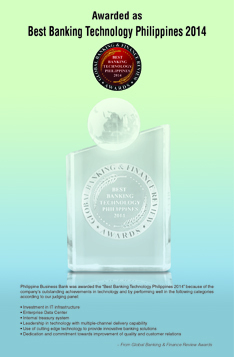 For two (2) consecutive years, Philippine Business Bank (PBB) takes pride to stay among the Top 30 cited technology initiatives by IDC Financial Insights. 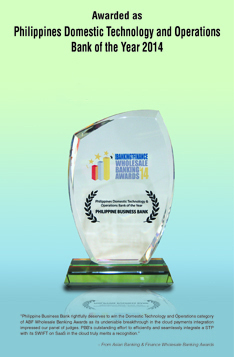 Philippine Business Bank recently celebrated its Crystal Anniversary with the theme: “Rising to the Challenge. Focused to Serve.” The event was jam-packed with more than 1,000 valued clients, special guests and friends of PBB, which was held last February 10, 2012.. It's so easy! Just open a savings or current account at Philippine Business Bank and get an android tablet absolutely FREE! Hurry! Visit the nearest PBB branch and enjoy your early Christmas Now! Philippine Business Bank's Chairman's Cup (a yearly held invitational golf tournament), recently took place at the Canlubang Golf & Country Club. This event coincides with the Bank's Crystal (15th) Anniversary. On the heels of an aggressive nationwide branch banking expansion program, the Board of Directors of Philippine Business Bank (PBB) has appointed professional banker Rolando R. Avante as the new President and Chief Executive Officer of this fast-growing savings bank. Philippine Business Bank (PBB) successfully bagged the Bronze Award for the Best Environment Initiative Category in the recently concluded Asian Banking & Finance Retail Banking Awards held on 20th of July 2011 at the Shangri La Hotel, Singapore. Another laurel was added to Philippine Business Bank (PBB) as it was one of the banks noted for its technology initiatives in the Asia/Pacific Region during the Asian Financial Services Congress's Financial Insights Innovation Awards (FIIA) 2011 held at the Marina Bay Sands, Singapore last February 24-25, 2011. PBB - FAST FORWARD @ 14! Philipine Business Bank celebrated its 14th Anniversary with the theme: “Fast Forward @ 14!” last February 15, 2011 at Wack Wack Golf and Country Club. An invocation led by VP Joselito D. Derivera started the program followed by the opening remarks from President & CEO Danilo A. Alcoseba and an inspirational message shared by Vice Chairman & COO Peter N. Yap. At a young age of fourteen, Philippine Business Bank (PBB) continuously making its growth faster than what is expected. With the recent openings of its Kaybiga, General Santos City and Bajada, Davao branches, the relocation of its Cubao and Calamba to a more strategic locations and soon to open branches in Valenzuela and Cebu City, PBB only shows its desire to better serve the demand of its..
A highly motivated badminton team from the Philippine Business Bank (PBB) bagged the 2nd place in the Silver Category of the 7th BAIPHIL Badminton Tournament. The event was held on November 6, 2010 at the Yonex Badminton Club Gym in Mandaluyong City. A recent inclusion to the Society for Worldwide Interbank Financial Transfers (S.W.I.F.T.) gives Philippine Business Bank (PBB) access and authority to send and receive authenticated messages such as foreign Letters of Credit, Telegraphic Transfers, Treasury transactions and other financial messages from the local and international counter parties with which the Bank has established its Relationship Management Application (RMA, formerly known as Bilateral Key Exchange-BKE). .
Philippine Business Bank's ATM Card---the BUSINESS CARD---goes high tech with its inclusion in the Bancnetonline system. Card owners with internet facility could now access their accounts via Bancnetonline system and choose from the different available transactions such as Balance Inquiry, intra account fund transfer, interbank fund transfer and bills payment. Three (3) members of the AMY Group of Companies, namely: Philippine Business Bank, Zesto and ZestAir, participated in the 36th edition of the Philippine Chamber of Commerce and Industry (PCCI) Business Conference and Expo held last October 13-15 at the Manila Hotel. To express gratitude to its valued clients, Philippine Business Bank recently held a Thanksgiving Dinner at Gloria Maris Restaurant, Greenhills. The affair was also in recognition and appreciation for the people who have been supporting and working behind the Bank for the past 13 years. Among the distinguished guests were Governor Amando Tetangco, Dep. Governor Nestor Espenilla Jr. and Monetary Board member Juanita D. Amatong of the Bangko Sentral ng Pilipinas. AMY Foundation, the social arm of Philippine Business Bank, recently added University of Mindanao (UM) in its roster of partner schools that would assist the Foundation in providing scholarship and support to less fortunate but deserving students to enable them to finish their college education. PBB Davao-Sales Branch, the Bank's first branch in the Mindanao area was formally blessed and inaugurated last July 16, 2010. Led by Chairman Emeritus Alfredo M. Yao and President/CEO Danilo A. Alcoseba, the affair commenced with the ribbon-cutting by Davao City Mayor Sarah Duterte and principal sponsors who are valued clients of the branch. Last August 28, 2010, all roads led to La Mesa Forest and Nature Reserve for a tree planting activity with AMY Foundation at the forefront, employees from AMY Group of Companies, namely: PBB, Zesto Corporation, ZestAir, RC Cola, Amchem and SMI Development trooped to the forest reserve for the tree planting and adoption of one hundred (100) trees. PBB: THE FIRST SAVINGS BANK TO GET THE AUTHORITY TO ISSUE FOREIGN LC..
Philippine Business Bank (PBB), the banking arm of Zest-O Group of Companies owned and controlled by business tycoon Amb. Alfredo M. Yao became the first savings bank to be granted the authority to issue Foreign Letters of Credit (LC) and pay/accept/negotiate import/export drafts/bills of exchange by the Bangko Sentral ng Pilipinas (BSP). Philippine Business Bank, one of the biggest savings banks in the country today celebrated its 13th Founding Anniversary last February 12, 2010 with its theme: Pagmamahal sa Bangko at sa Bayan. To observe the true essence of this year�s theme, PBB gave honors to the three (3) heroes of Typhoon Ondoy.